Dr. Wu is committed to caring for his patients’ oral health. He has always focused on prevention, but also offers a wide variety of procedures to correct any problems that may arise with your teeth or gums. Dr. Wu graduated with honors from UCSF School of Dentistry, and he has many years of experience in general, cosmetic, and implant dentistry to ensure you receive the proper care and treatment you need. One of Dr. Wu’s focuses is on minimally invasive dentistry, which means that you do not have to worry about hefty oral surgery or procedures that will take you many days to recover from. In fact, Dr. Wu offers conservative recommendations for procedures to ensure you are healthy and you do not have to undergo a procedure that is not needed. 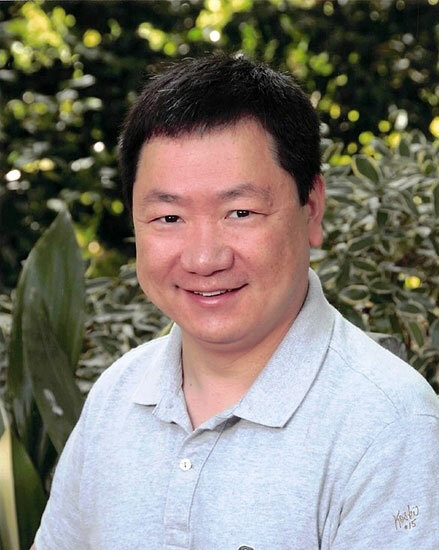 In addition to dental care, Dr. Wu focuses on clinical and dental research. He has participated in a number of dental studies to better understand how patients react to specific procedures. Dr. Wu also spends time learning and educating himself as much as possible to stay abreast with new dental technology and procedures. Tuan, T.L., Wu, H., Huang, E.Y., Chong, S.S., Laug, W., Messadi, D., Kelly, P., Le, A. (2003). Increased plasminogen activator inhibitor-1 in keloid fibroblasts may account for their elevated collagen accumulation in fibrin gel cultures. Am J Pathol. 162(5):1579-1589. Huang, S., Wu, H., Jong, A. (2002). Gene cloning and Expression profiling by Rapid Amplification of Gene inserts with Universal Vector Primers. DOI:10.1385/1-59259-177-9:309. Huang, E.Y., Wu, H., Island, E.R., Chong, S.S., Warburton, D., Anderson, K.D., and Tuan, T.-L. (2002). Differential Expression of Urokinase-type Plasminogen Activator and Plasminogen Activator Inhibitor-1 in Early and Late Gestational Mouse Skin and Skin Wounds. Wound Repair and Regeneration 10(6): 387-396. Han, Y.P., Tuan, T.-L., Hughes, M., Wu, H., and Garner, W.L. (2001). Transforming growth factor-beta – and tumor necrosis factor-alpha -mediated induction and proteolytic activation of MMP-9 in human skin. J. Biol Chem. 276(25):22341-22350. Han, Y.P., Tuan, T.-L., Wu, H., Hughes, M., and Garner, W. (2001). TNF-a stimulates activation of pro-MMP2 in human skin through NF-kB mediated induction of MT1-MMP. Journal of Cell Science 114, 131-139. Island, E.R., Wu, H., Warburton, D., Anderson, K., Tuan, T.-L. (2000). Expression of extracellular matrix proteases by fetal and adult murine skin fibroblasts cultured in in vitro matrices. Current Surgery 57, 640. Island, E., Huang, E., Wu, H., Warburton, D., Anderson, K., and Tuan, T.-L. (2000). Extracellular matrix degrading protease expression and cell migration of fetal skin wounds. Molecular Biology of the Cell 11, 482a. Island, E., Wu, H., Warburton, D., Anderson, K., and Tuan, T.-L. (1999). Developmental differences in the expression and modulation of extracellular matrix proteases and inhibitors in mouse skin fibroblasts. Wound Repair and Regeneration 7, 467-476. Wu, H., and Tuan, T.-L. (1999). Wound matrices modulate the expression of uPA, PAI-1, MMP-2, and TIMP-2 of skin fibroblasts. Molecular Biology of the Cell 10, 348a. Island, E.R., Wu, H., Warburton, D., Anderson, K., Tuan, T.-L. (1999). Developmental modulation of extracellular matrix proteases, and protease inhibitors in mouse skin fibroblasts. Molecular Biology of the Cell 10, 348a. Wu, F., Buckley, S., Bui, K.C., Yee, A., Wu, H., Liu, J. and Warburton, D. (1996). Cell-cycle arrest in G0/G1phase by contact inhibition and transforming growth factor-b1 in mink Mv1Lu epithelial cells. American Journal of Physiology 270, L879-L888. Wu, H., E.Y., Island, E.R., Le, A., and Tuan, T.-L. (2002). PAI-1 Increases Fetal Mouse Skin Scarring. ADA convention Table Clinic, Oct. 21st, New Orleans, Louisiana. Huang, E.Y., Island, E.R., Wu, H., Anderson, K.D., Warburton, D., and Tuan, T.-L. (2001). Differential Protease expression in fetal versus adult mouse skin wounds. The Wound Healing Society Meeting 2001, May 16th ~ 18th, Albuquerque, New Mexico. When Dr. Wu is not in the office, he is out volunteering in the community, jogging half marathons, and spending time with his family. To schedule an appointment with Dr. Wu, call us at (650) 571-6666 for our San Mateo office or at (650) 718-5086 for our Mountain View office.